This week was a challenge again. We have so many wonderful dolls in the collection, I can’t pick just one! I wrote a post on the Alaskan Doll earlier, so we’ll choose a couple of new ones this time. 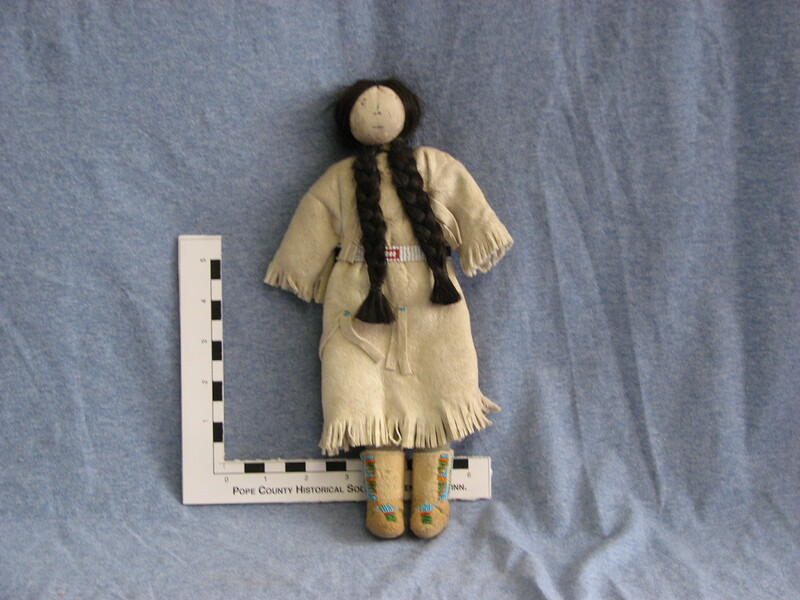 This Shoshone doll from the Wyoming tribe is wearing typical native dress worn on formal occasions by a chief’s wife. Her moccasin boots are yellow-beige buckskin and beaded. The dress is of white buckskin, fringed with beaded belt. A long black braid hangs down the front on either side of her face. The doll even has undergarments. 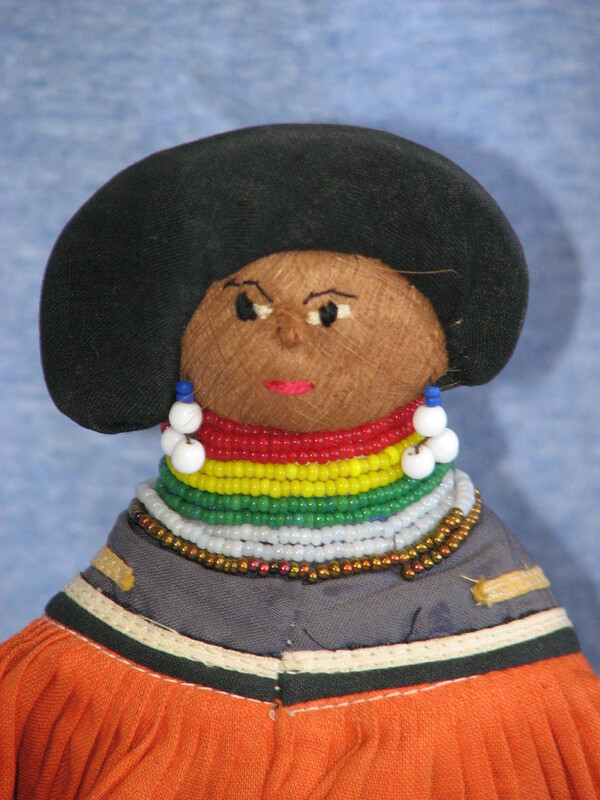 Cleora’s object notes listed the maker as Annie Washakie, while the guidebook Cleora wrote said it was Eva Washakie, grand-daughter of Chief Washakie that made the doll. The story in the guidebook says that Eleanor Roosevelt came to visit Haskell Institute, and the director of the school wished to give her these dolls, but the student refused. She said she had made the dolls specifically for Miss Helbing. In 2008, I contacted a Shoshone Artist named Eva McAdams (Formerly Eva Washakie), but she was not the maker of the dolls. She did however remember Annie Washakie who had a daughter Eva who went to the boarding school. Both Annie and Eva have passed away. 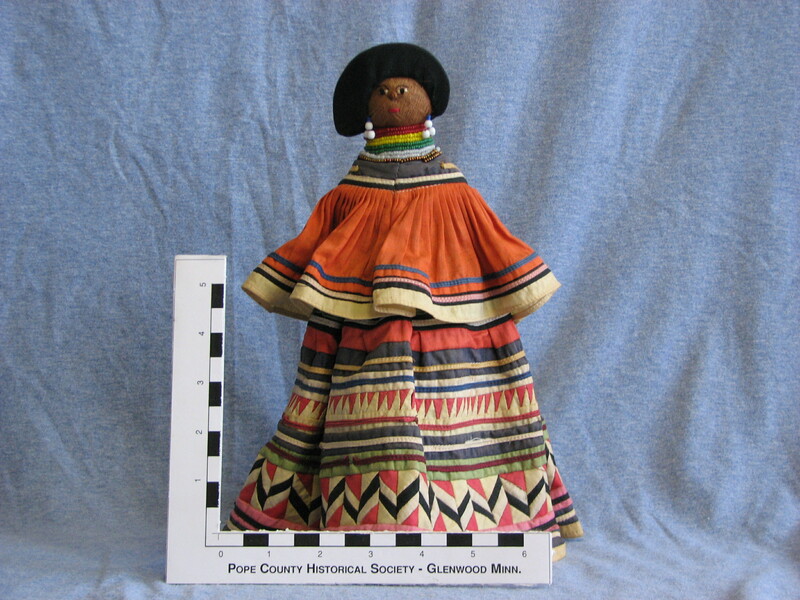 There is a label under the skirt that reads “Genuine Hand-made Seminole Doll, made by Annie Cypress, Big Cypress Indian Reservation” The dress is made up of tiny pieces of fabric. The color scheme is mostly pink, blue and white. The design alternates groups of horizontal stripes with 2 bands of geometric designs, all machine pieced. The cape is orange with stripes in the edge and the facial features are stitched on. This entry was posted in Collection Notes and tagged A-Z, Cleora Helbing, Doll, eva washakie, indian doll, museum collection, Native American art, seminole, Shoshone. Bookmark the permalink.